April 5, 2007 – Mark St.John (Kiss) born Mark Leslie Norton in Hollywood, California on February 7, 1957. St.John was Kiss’ third official guitarist, having replaced Vinnie Vincent in 1984. He started out as a school teacher and guitarist for the Southern California cover band Front Page, before joining Kiss. By this point, Kiss had done away with its trademark makeup and costumes, but the group was enjoying a career renaissance. The lone Kiss album on which St. John appeared, “Animalize,” re-established the group as one of the world’s top arena metal bands. The album spawned the popular MTV video, “Heaven’s on Fire” (the only Kiss video to feature St. John). St. John’s flashy playing reflected the era’s Van Halen-influenced rock guitarists, but it certainly helped spark the material on “Animalize,” which many fans consider one of Kiss’ strongest non-makeup releases. However, right around the time Kiss was to launch a worldwide tour in support of the album, St. John was diagnosed with a form of arthritis called Reiter’s Syndrome, which caused his hands and arms to swell, and prevented him from playing guitar. Guitarist Bruce Kulick filled in (St. John did manage to play one full show with the group, and portions of a few others) and eventually replaced St. John as Kiss’ permanent guitarist. 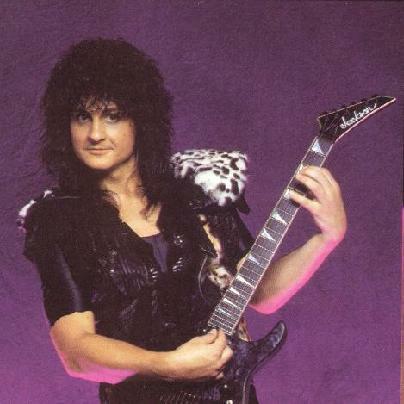 Mark St.John died of a cerebral hemorrhage brought on by an accidental overdose of methamphetamines on April 5, 2007. He was 50 years old.